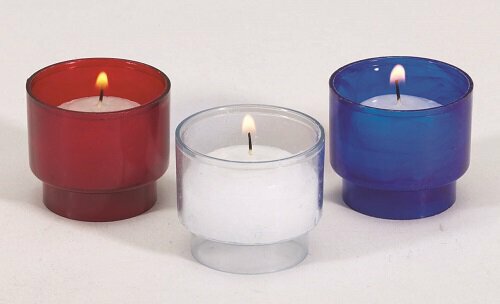 Brite-Lite Voticandles® are an environmentally conscientious and economical alternative to traditional votives. Carefully blended paraffin and palm wax allow for longer, smoke-free burn. The PC (polycarbonate) plastic candleholder is a more earth friendly alternative to the PVC (poly-vinyl chloride) plastics found in our competitor's products. These candles are lightweight, unbreakable, shatter resistant and safety tested to withstand more heat. The combination of durability, safety and environmentally responsible benefits assure the fine quality you have come to expect from Will & Baumer®. A stand filled with Brite-Lite Voticandles® is easily cared for disposable, attractive, no wax clean-up and smoke-free. All Brite-Lite Voticandles® are recommended to be burned in a votive glass container or other appropriate votive container for better performance and safety. Sold in quantities of 504 pieces per case.